Martin's lowest-cost all-solid 000 performs well, but faces extremely stiff competition at this price. Nice, piano-like projection. Cosmetic niceties. Well built. USB connection is hardly future-proof. Doesn't sound great plugged in. Part of the Road Series made at Martin's factory in Mexico, this is the least expensive, gloss-topped, all-solid wood 000 in Martin's catalogue... even though it has the 25.4-inch scale more commonly associated with the OM. The top is solid Sitka spruce on Martin's simple A-Frame X-1 bracing and mortise-and-tenon neck joint. Finished with simple black binding, basic rosette and, of course, that gloss-finished top, it has cosmetic and practicality niceties absent from many modern Martins, albeit at the expense of some material choices. "The fingerboard is Black Richlite, a man-made material that we've praised in the past for its ebony-like look and feel"
For example, back and sides are solid sapele instead of 'genuine' mahogany, and the neck is sipo (also known as utile), a mahogany-alike African hardwood. You might consider it a step up from the multi-laminate Stratabond used elsewhere in the Road Series, however. Fingerboard and bridge are Black Richlite, an FSC-certified man-made material that we've praised on acoustic and electric guitars in the past for its ebony-like look and feel. The satin-finished neck has a modified low oval profile, so it's an easy and fast player with a similarly inviting setup. On the side, you'll find a micro USB output alongside a standard jack, so the Fishman Sonitone under-saddle pickup and preamp can connect directly to your computer or tablet via USB; it needs no drivers and works flawlessly into the iPad and Macs with which we tried it. The 000RSGT sounds wide, in the sense that the trebles and low midrange are complex, but also narrower than the spruce/rosewood dread' we had to hand for comparison - the dread' warmth and resonance is gone. "The advantage of the traditional OM scale length is you get slightly more piano-like string separation and projection"
We mentioned the traditional OM scale length earlier, and its 'advantage' over the shorter 000 scale (24.9- inch) is that you tend to get slightly more piano-like string separation and projection. Here, the longer scale works with the 000RSGT's fairly direct voice to bring clarity to complex fingerpicking well, especially when using dropped tunings. It's a tonal step up in terms of sonority and depth from Martin's HPL guitars, but played alongside the (four grand!) Martin 000-42 we had to hand, sounds somewhat unrefined. Plugged in, the simple Sonitone preamp does a dependable under-saddle piezo job; tons of output level and good string balance. There's a useful range of high-end attenuation available from the tiny tone control just inside the soundhole, but you never really lose that edgy piezo zing. On the upside, the USB out sounds just as good as the jack output when recording direct. 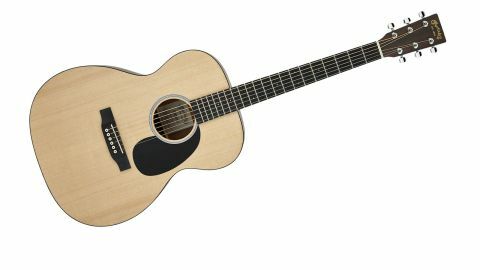 The 000RSGT is in a hard world, facing extremely stiff, extremely well-spec'd competition from the likes of Yamaha, Takamine and Guild. It's less refined-sounding than vintage-style 000 and OMs, albeit still with a credible, more focused tone for picking and strumming, both when playing live and for recording. The USB output raises a question mark, however; while it works well and sounds fine, it will almost certainly become outdated quickly as technology and connection types change.